The optimum combination of minimum quantity lubrication (MQL) oil as well as specific MQL tooling leads to an increase in productivity and higher tool life. With an increase in the feed rate and the cutting speed of 130 m/min to 390 m/min in stainless steel 1.4307, the productivity increased by more than 70%. In addition, tool life was increased by 243%, with this higher material removal rate. 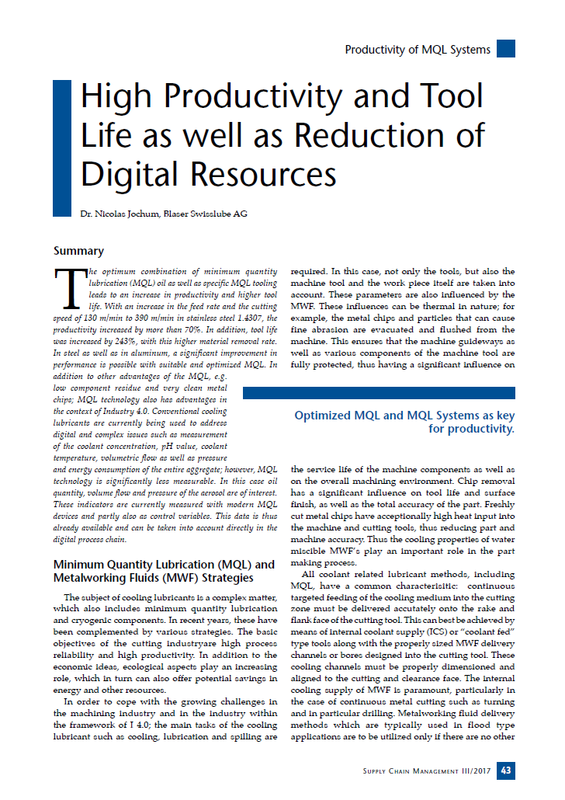 In steel as well as in aluminum, a significant improvement in performance is possible with suitable and optimized MQL. In addition to other advantages of the MQL, e.g. low component residue and very clean metal chips; MQL technology also has advantages in the context of Industry 4.0. Conventional cooling lubricants are currently being used to address digital and complex issues such as measurement of the coolant concentration, pH value, coolant temperature, volumetric flow as well as pressure and energy consumption of the entire aggregate; however, MQL technology is significantly less measurable. In this case oil quantity, volume flow and pressure of the aerosol are of interest. These indicators are currently measured with modern MQL devices and partly also as control variables. This data is thus already available and can be taken into account directly in the digital process chain.